China may not have Facebook, but it looks like the country is getting timeline. Renren, a Chinese social media site, has pretty much copied the design of Facebook's timeline, right down to the introduction page. China may not have Facebook, but it looks like the country is getting timeline. Renren, a Chinese social media site, has pretty much copied the design of Facebook’s timeline, right down to the introduction page. As first reported by sister site Inside Facebook, Renren has been a constant shadow of Facebook, which is blocked in China. Now the site has launched something similar to timeline. Renren is even copying the fancy scrolling introduction that accompanied the site’s move to timeline in other parts of the world. In music parlance, Renren has sampled Facebook’s news feed, mobile, and profile looks. The website introducing the changes shows things such as the cover photo, profile photo, and life events — all Facebook creations. Although if they were smart, they wouldn’t use our float model and use absolute positioning. They’d just need to build some sort of global register for any size changes. I’m not entirely sure how good their engineers are, since they don’t often create anything, but it’s bound to be difficult work to reverse-engineer everything, so they’re not fools. Parker added that the code he used to make timeline work in Internet Explorer 6 is also in Renren’s new product. This timeline-like design rolled out last month for Renren users in beta and, just like Facebook, it will be introduced gradually for all users. Renren has also copied Pinterest in the past. 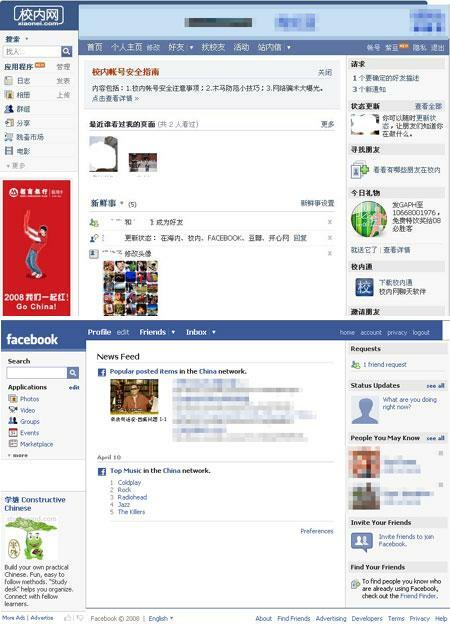 Readers: Do you think Renren users will rebel against the changes the way many Facebook users have timeline?